The company was started in 1997 by David Bowler, a classical dressage rider and keen supporter of traditional French training methods, as Modern Equestrian Concepts. Having developed the saddles and accessories during several years of extensive research into the biomechanics of horses and riders, he formed the company in partnership with saddler Michela Ling, whose name was used as a brand for the products. The first saddle to be developed was the Strada dressage saddle, named after David’s older horse, who inspired David to try and find a solution to endless saddle fitting problems. This saddle was noticed by the endurance community, who adopted it because of the comfort it could give horses and riders over long distances. Luggage attachment points were added to the original design and the St.Christopher endurance saddle was born. The saddles soon became popular with riders who wanted a really good fit for their horse. However, they never received the exposure they deserved, as available funds were primarily used for ongoing research and development, rather than marketing. 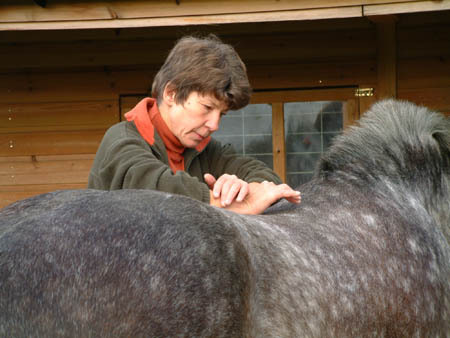 In 2003 Ilga Cottle, a McTimoney Animal Practitioner (back manipulation therapist) and life-long rider (competing in dressage and show jumping, starting youngsters, running a livery yard, teaching) bought a saddle from David, hoping to address the repeated fitting problems experienced with her own horses. She was so impressed with the performance of the saddle, both from the rider’s and the back therapist’s point of view, that she decided to become involved. In 2005 Michela retired from the company, Ilga became David’s business partner and the company was re-named Strada Saddles Ltd.. In 2007 David wanted to change some aspects of the design of the saddles, while Ilga wanted to stay with the original concept. Also, David wanted to market the saddles worldwide, while Ilga was mainly interested in the UK market. It was agreed that two separate companies were the best way forward.